We spell the Holocaust with a capital “H” because it represents the single most vast and devastating example of genocide in history. At the behest of the German government, more than 6 million Jews were systematically exterminated, in addition to at least four million additional “undesirables” (gypsies, homosexuals, political prisoners, Russian prisoners, criminals, etc.) Consider the plight of European Jews. They were not given an injection to speed their way into a painless death. They were exterminated, like annoying insects. They were gassed to death, because that was the most efficient way to dispose of six million men, women and children – who happened to be Jewish. For centuries, these Jews had been good German citizens and neighbors, fighting and dying in Germany’s wars and contributing to Germany’s artistic, scientific and commerce success. By 1938, they had become vermin, to be exterminated. Why would German citizens allow their neighbors to be annihilated? Jews in German-controlled lands were ousted from their schools, jobs and homes, forced to live in squalid ghettos. All of their money and possessions were looted by the German government and local citizens. Then, the captured Jews were transported to concentration camps, where they were often forced to work as slave laborers. Finally, they were transported to death camps, where they were gassed to death and their bodies created. We know this to be true, not simply from the anecdotal recollection of survivors and witnesses, but from captured German documents. The German government carefully recorded the name of each Jew, in each concentration camp, on their inevitable road to certain death. Jews that escaped were rounded up by the Nazi’s civilian workforce, the Einsatzgruppen. The Einsatzgruppen were gangs of local thugs, criminals and civilians throughout Europe and Russia, who uncovered Jewish men, women and children, captured them for the SS and, all too often, were told to shoot the Jews and bury them in trenches. One such location of the mass murder of Jews was a place called Babi Yar, not far from my mother’s birthplace, in the Ukraine. Women, the elderly, the sick, the frail and children were often the first into the gas chambers. Men and hardy women were kept barely alive for their value as forced labor. Those able to work were employed as slaves for the benefit of the military and German industrialists. Some of those German companies exist today, albeit with different names. Some still have the same name. When there was no more work, they too were murdered. My mother experienced anti-Semitism as a child in Russia. Cossacks and local citizens persecuted Jews in the towns and villages of the Ukraine. My mother and her sisters survived by leaving Europe and immigrating to America before the Holocaust. However, most of her remaining family died in the Shoah, the Hebrew word for Holocaust. I hold this genocide close to my heart. It is a cumbersome stone attached to my soul, a burden of remarkable proportions. My ancestors cry out for justice through the words of “Jacob’s Courage.” This story cannot be told without revealing the Holocaust in every detail. It is a terrible and beautiful story, filled with heroes and villains, love and laughter, tragedy and survival. The genocide of six million innocent people must be told and remembered. If not, there would be nothing to prevent more genocide, and then more after that. Otherwise, our progeny might embrace the worst of human nature. We must reveal this tragedy to our children and they must pass it along to their progeny. This does not demean the importance of other Holocausts. The Armenian genocide was no less tragic, only smaller in scope. Those innocent people who were murdered in Cambodia, Bosnia, Rwanda and Darfur were just as blameless. When will we lose apprehension over those who are dissimilar? When will we learn to value the differences among us, rather than fear them? When will we stop ostracizing people because of their religion, race or ethnic heritage? In the 21st century, we must become better than that. We must acquire tolerance and compassion, rather than continue with fear and hatred. I appreciate books that offer a frank, emotional examination of morality. Humans are not good or bad, but good and bad. We surround ourselves with romance and comedy, playing to the healthier parts of our emotional identity. Yet, repugnance, despair and obscurity exist within human nature. We learn nothing about ourselves if we do not examine that dark side of our psyche. “Jacob’s Courage” explores human behavior during the most horrendous genocide in history. If any benefit can come from the Holocaust it is that we can examine the furthermost extent of human depravity. We can measure its immorality, degeneracy and malevolence. Yet, humans are complex beings. There is a great deal more to our nature than the ubiquitous battleground of virtue versus evil. We are not one or the other, but a combination of both. We are beautiful and ugly, soothing and terrifying, brutal and caring, kind and iniquitous; we love and we despise. Deep within the fear and panic of the Holocaust were vastly critical decisions about ethical behavior, revealing our concept of morality. Unlike animals, humans are governed by principles, ethical beliefs and veracity. We are not clouded by delusions of integrity, but governed by them. In “Jacob’s Courage,” my characters explore the human response to terror, as well as the alluring beauty of passionate young love and the driving power of religious devotion. 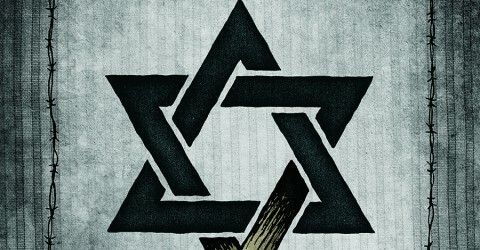 Our lives are complex – even within the garish trap of the Holocaust. Not all Jews were innocent victims. Not all Germans were rabid anti-Semites, bent upon the destruction of the Jewish “race.” Some Jews were themselves evil and became concentration camp “kapos.” Some gentiles were compassionate and rescued many Jews. In reality, the world is seldom seen in black and white, or shades of gray – especially during the Holocaust. In the midst of terrible anguish, beauty existed. Within beauty, despair can exist. And, while many Jews in the abyss of the Holocaust worshipped God, some condemned God. While it might be easy to claim that God works in mysterious ways, how is one to focus on religious constructs when the veneer of all that is good in life has been stripped away? How does one continue to love a God who allows the murder of every loved one, who allows us to be starved, beaten, tortured, denigrated, disfigured and emotionally destroyed? Perhaps this was the ultimate test of faith. Holocaust survivors lost everything, but perhaps somehow gained something as well. Certainly an honest examination of the Holocaust must reveal torturous brutality, starvation, sickness and death. Most Holocaust survivors lost all of their loved ones. The facade of life’s beauty had been stripped away, revealing an incomprehensible abyss of revulsion. Yet here, in the bowels of terror, the Jews of the Holocaust hit a wall and continued to run. Despite the onslaught of evil, in the face of certain death, these Jews fabricated a make-believe world for their children. Deep within the horrid transit concentration camps of Nazi Germany, such as Theresienstadt, the Jews of Europe continued to practice their religion, to teach their children and to love one another. This is where Jacob and Rachael marry, among the shadows of death and the stench of decay. This is where the Jews of Europe, condemned to certain death, continued to worship God, in the manner of their ancestors for countless centuries. Here, waiting to be sent to the gas chambers and crematoria, one can feel hope for the survival of the human spirit. These singular moments rise like a fabulous phoenix, from the ashes of annihilation. Those poor souls trapped within the terror of the Holocaust were faced with the most perfidious forces. Deceit, brutality, cruelty, sickness, starvation and the death of loved-ones were the daily companions of Holocaust victims. Yet, in the midst of utter despair, there was life, love, passion, desire, religious fervor and the excitement known only to children. Even in such hopeless desolation, there was love of God, infatuation, romance, passion and longing for all of the things that humans crave. Jews fabricated their ethnicity within the drumbeat of the slow, steady march to the gas chambers. They refused to allow the fabric of Jewish society be torn by relocation, forced labor, starvation and the endless threat of demise. They created schools, orchestras, athletic events, synagogue and prayer, weddings and funerals, dances and theatre, study groups and debates; to every hell-hole the Jews were sent; they took their values and their faith with them. Rather than give in to the Nazis, Jews trapped within ghettos and concentration camps courageously re-created their culture and religion. Some of the most ardent examples of constructive human nature can be found in these terrifying Holocaust moments. Hidden from the SS, concentration camp Jews observed the covenants and rituals of Judaism. They prayed on the Sabbath and during the major holidays, celebrated marriage ceremonies, arranged burials and even ritual circumcisions. Along the dark, terrifying, relentless path to the gas chambers of Nazi-occupied Europe, Jews lived, loved, learned and died, behaving as though their lives would continue unabated. In their darkest moments, the Jews of Nazi concentration camps fabricated a “normal” life for their progeny. Despite their impending mortality, they created an ordinary world on the inside to protect children from the raging genocide on the outside. Such was the nature of their love, faith and devotion. Indeed, this worship transcended parental affection. Into the gas chambers and crematoria, the Jews of the Holocaust emptied their faith and continued to worship the God of their ancestors. The human spirit strives for autonomy and freedom. Yet, to understand human nature, one must descend into the depths of depravity and terror. We cannot appreciate humanity without comprehending its wicked flaws. Deep within the darkest recesses of brutal genocide, we discover a faint flicker of light representing love, passion, desire, hope, worship and reverence. Here is the essence of humanity – a flicker of light representing morality, faith, love, compassion and righteousness, in the midst of the dark whirlwind of malevolence. This is why we must always tell the stories of the Holocaust. Such stories represent the very worst of human vilification and the very best of our compassion. Holocaust stories teach us how to recognize the worst examples of humanity, but also how to be a good person. The terror of genocide is not necessarily an inevitable human outcome. We must learn from the mistakes of our past, rather than repeat them. As long as we teach our children about the Holocaust, there is hope that it will never happen again. HTML. I’m starting a blog soon but have no coding skills so I wanted to get guidance from someone with experience. Any help would be enormously appreciated! I’ve used BlogSpot and WordPress. Both sites do the HTML coding for you. This is really the 4th blog, of urs I actually browsed. Thanks for writing. What an awesome cause. Congratulations and good luck! 2. Concentration camp workers admitted that they murdered millions of Jews. Show us ONE proof for one of the above statements. ps.What happened to the materials I copied here from the websites you recommend like NIZKOR? My post of 7/29/10 listed dozens of Internet sites that possess Holocaust data that is considered by professional historians around the world to be beyond doubt. When someone suggests here that information from the US National Archives, the US Holocaust Museum, Yad Vashem and Nizkor is wrong, then I know I’m dealing with a true anti-Semite or an idiot. These sites contain tens of thousands of captured German war records that all point to one indisputable fact. Nazi Germany and their allies exterminated six million Jews and tens of thousands of others that they found “racially impure” or who were considered political prisoners. This evidence is so abundant and robust that one could convict the perpetrators of the Shoah in any court with the captured documents alone. In other words, you can forget about the thousands of pieces of anecdotal evidence, including testimonials from camp guards, victims and Nazi leaders – all admitting to the murder of millions of Jews. You can forget about the hard evidence, including still-standing gas chambers and crematoria. You can discount the testimony of those who lived downwind of the camps and whose homes and vehicles were buried under tons of human ash. The captured German war records alone are enough to convict Nazi Germany of massive genocide against millions of innocent Jewish men, women and children (and the many thousands of others). Anyone who denies this today is dreadfully ignorant, woefully anti-Semitic or both. Again, see my links in the post of 7/29/10. Only a fool would deny such profuse and persuasive substantiation. The Wannsee Conference records prove that Nazi Germany’s leadership intended to exterminate all of Europe’s Jews, primarily using gas chambers and crematoria. These records still exist (see US Holocaust Museum, US National Archives and Yad Vashem). These same leaders admitted after the war in court to fabricating the camp construction as elicited in Wannsee Conference records (see Nuremburg trial testimony). Nazi leaders designed the camps. The camps were built. Some of them still stand. The architectural drawings still exist, as do the crumbling gas chambers and crematoria. The camp guards admitted to murdering millions of innocent Jews. They could have lied about it, denying their culpability. Instead, they admitted to murdering millions of innocent people, claiming they were “just following orders” (see records from the Nuremburg trials). All of these records are posted on the Internet (see my links from 7/29/10). I will not allow anyone to post Holocaust-denial rubbish on this site. The people who do this are not historians. They obtain invalid information from other Jew-haters who are also not historians. Why would I want to post such obvious lies on this site, when there is plentiful factual evidence posted by real historians? When someone suggests that the US Holocaust Museum, Yad Vashem and the National Archives have all conspired to lie about the Holocaust, I know that they are not worthy of appearing in print anywhere, much less here. They are simply mendacious bigots. And, I will not allow bigots to post here. This is a site for the dissemination of facts, not anti-Semitic rhetoric. 4. Captured German war records prove that millions of innocent Jews were incarcerated, enslaved and murdered. Nothing here is “ad hominum.” Everything here is verifiable and extensively researched. Most of this data comes directly from captured German records, uncovered by Allied armed forces and processed through the Nuremburg trials. Many of these records are housed in the US National Archive. It is also based upon 65 years of thesis and doctoral research studies, conducted by professional historians around the world. This is as close to the truth as we can safely say today. It establishes without room for doubt that millions of innocent Jews were systematically exterminated and that most of them were killed in gas chambers. Only a fool or a raving anti-Semite would suggest that the US Holocaust Museum, Yad Vashem and Nizkor are inaccurate in their research. Virtually every PhD historian around the world agrees with this data. No topic in history has been researched more thoroughly than the Holocaust. Tens of thousnds of records, in addition to the testimony of those who admitted to the killing have been reviewed. There is no wiggle room here. Millions of innocent Jewish men, women and children were murdered because they were Jews. Nazi leaders admitted to the planning. Camp workerd admitted to the genocide. Many thousands of victims testified to the accuracy. The facts here speak louder than words. When 98% of all historians agree that millions of Jews were systematically exterminated by Nazi Germany, this is as close to FACT as humans can achieve. Historians around the world agree that Nazi Germany murdered millions of innocent Jewish men, women and children. Should we accept the twisted contortions of a handful of racists over the vast agreement of professional historians? Posts that offer blatant fabrications about the Shoah are not visible here because they could be mistaken for the truth by weak-minded readers. Therefore, what you call “censorship” is in reality protection of our vulnerable progeny from lies about the Holocaust. If we allow such lies about the Holocaust to be viewed, we risk another such holocaust by weak-minded people in the future. When someone posts lies that have been revealed as fabrications by thousands of thesis and dissertation research projects, they do not deserve to see the light of day. Such individuals proffer prejudice and racism instead of veracity. This behavior is nothing more than mendacious. That is why the posts were deleted here. There is only one truth and that has been agreed-upon by 98% of professional historians. Millions of innocent Jews were murdered. This is as factual as gravity. Why teach lies to those who could mistake them for facts? Jim, no one here called you “anti-Semitic” or a “fool.” In fact, no one here has called you anything at all. This is the first time we’ve seen your name. As for the veracity of my “facts,” I stand by them. Perhaps you can tell us where you obtained your liberal arts degree (you must have been a history major to be so self assured in denying the accuracy of my facts). I await your correction of my facts with valid references. BTW, you failed to conjugate the word “you’re” (“Ever think your so fullshit…”). Perhaps you didn’t complete many postgraduate English courses. Masonic (satanic) blood-lines – Scottish Ritual Freemasonry’s intended NEW WORLD ORDER/scripted WORLD WAR THREE. I think the best way to learn facts about the Holocaust is to review university post-graduate research. No event in human history has been studied more thoroughly and carefully than the Holocaust. Thousands of thesis and dissertations papers have poured over mountains of data, from physical evidence and anecdotal testimony to captured German war documents. Virtually everyone with a PhD in History will stake their career on the fact that millions of Jews (and others) were systematically exterminated by Nazi Germany. Whenever we stand up to those who deny or minimize genocide we send a critical message to the world. As we continue to live in an age of genocide and ethnic cleansing, we must repel the broken ethics of our ancestors, or risk a dreadful repeat of past transgressions. Freedom of speech is a symbol of a healthy society. Yet, since no crime in history is as heinous as the Holocaust, its memory must be accurately preserved. We must protect vulnerable future generations from making the same mistakes. I’m not unwilling to look at web sites that portend to deisplay Holocaust truth. Yet, the only web sites that really count are those that disply empirical researched that has been vetted throughout the post-graduate historical community. In other words, no fact is true only because someone suggests it (non-sequitur ad hominum). A statement is true after it has been empirically proven. That kind of research is typically accomplished at or near institutions of higher education. A world that continues to allow genocide requires ethical remediation. We should insist that religious, racial, gender, orientation and ethnic persecution is wrong; and that tolerance is our progeny’s only hope. Only through such efforts can we reveal the true horror of genocide and promote the triumphant spirit of humankind.